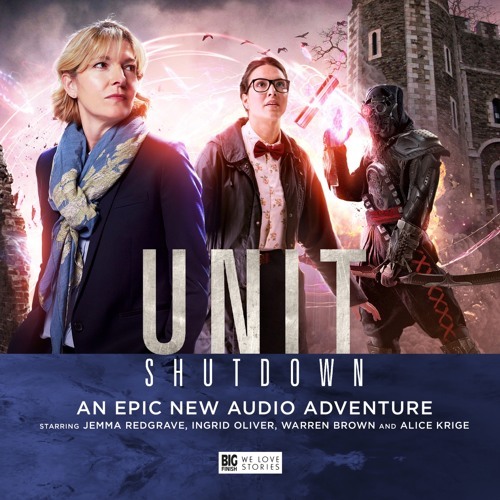 Kate Stewart and her UNIT team investigate and confront alien attacks on the planet Earth in the new 5 disc boxset. 2.1 Power Cell by Matt Fitton Osgood and Captain Josh Carter are sent to investigate the disappearance of a UNIT scientist. Meanwhile, alien technology has fallen into the hands of Lyme Industries, and Kate Stewart can't persuade the company’s CEO, Felicity Lyme, to give it back. But UNIT find themselves fighting a third battle when innocent people start to die. Who are the mysterious assassins? And what does Felicity Lyme want with top secret alien technology? 2.2 Death in Geneva by Andrew Smith With few people left to trust, and with assassins on their tail, Kate and Osgood race to UNIT Command in Geneva. Will General Blair be able to help them? But when death follows UNIT all the way from the English countryside to the snowy slopes of the Alps, Captain Carter finds himself in a race against time. As the body count rises, Kate struggles to separate friend from foe, danger circles Osgood ever closer, and, high in the mountains, Josh comes face to face with the enemy... 2.3 The Battle of the Tower by Andrew Smith The threat is now clear, and Kate Stewart retreats to UNIT HQ with her most trusted colleagues. She has no choice but to place the Black Archive into lockdown, and the Tower of London is where UNIT will make its stand. While the capital sleeps, an alien horde is gathering, ready to rise from the shadows to attack Earth’s greatest defence force inside its own stronghold. The Tower is infiltrated, and UNIT must hold the line. At any cost. Lock and load... 2.4 Ice Station Alpha by Matt Fitton Caught between human greed and an unstoppable alien power, Kate Stewart leads her closest allies on one final, desperate mission. This could be the very last chance for the human race. But the UNIT team has been declared rogue, and ruthless military forces are in pursuit as they race across the globe. Kate calls Lieutenant Sam Bishop to their aid, while Josh and Osgood head out across the frozen Antarctic plains to try and prevent a disaster no-one else knows is coming.